On the Electrodynamics of Moving Bodies was commissioned by Wilhelmina Smith and the Salt Bay Chamberfest in 2012 and premiered at the Darrows Barn in Damariscotta, Maine on August 24, 2012 by Steven Copes, violin, Edward Arron, cello, Romie de Guise-Langlois, clarinet, Conor Nelson, flute, and Pedja Muzijevic, piano. On the Electrodynamics of Moving Bodies is titled after Albert Einstein's famous 1905 paper in which he describes his theory of special relativity. This work was commissioned by Wilhelmina Smith and the Salt Bay Chamberfest in 2012, and all concerts that year were programmed under the theme "time passing." To connect with the theme, I focused on creating a musical representation of time dilation, a mind-bending effect that happens when two objects are moving at extreme speeds in relation to each other, causing each to observe the other as moving at a slower rate of time. 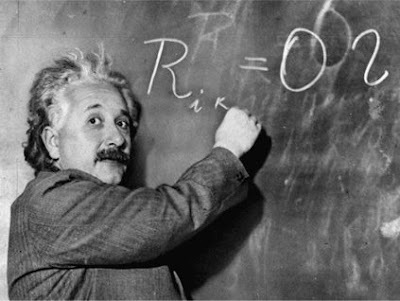 I am fascinated by science and love to write music about my amazement for various scientific concepts, and while I only superficially understand the premises of special relativity, I hope that this piece of music reflects the excitement that I feel while learning about the incredible scientific ideas of Einstein. The music captures an imaginary journey that begins slowly and approaches relativistic speeds by the end. Beginning ethereally, disparate musical elements gradually coalesce into a jaunty melody. A repeated descending chord figure always occurs at the same rate of time, while the other melodic elements of the music are wildly varying in speeds at the music progresses. I use numerous downwardly bending pitches to mimic the more earthly doppler effect that occurs when a quickly moving object moves away from a listener, and even this concept gets stretched out as the piece progresses. As the overall acceleration reaches a frenetic speed, the instruments begin to pull apart, some speeding away while others become slower and heavier until one final outburst, marked in the music as "hyperspace." I am currently self-published. You may purchase this piece below. If you need a quote for a purchase order, please contact me.